Most of the 250 megawatts of energy storage ordered up by Southern California Edison last week consists of batteries, from the 100-megawatt lithium-ion battery complex being built by AES Energy Storage, to the 85 megawatts of closet-sized, behind-the-meter batteries promised by Stem. But SCE is also getting 25.6 megawatts of a grid capacity product that uses temperature, not chemical reactions, to "store" energy. That’s Ice Energy’s rooftop air conditioning unit, which uses cheap nighttime power to turn water to ice, and then uses that ice to reduce how much electricity is needed to operate the air conditioning during the heat of the day. Last week, Ice Energy announced it had won sixteen contracts with SCE to deploy its Ice Bear rooftop units over the next six years. Each Ice Bear can defer about 10 kilowatts of power use during the day, which means that the Glendale, Calif.-based company will be deploying about 2,500 of them across the utility’s West Los Angeles Basin region, the target of last week’s broader procurement. Ice Energy, which has raised about $90 million since its 2003 founding, has deployed more than this amount of energy storage for California municipal utilities like Glendale Water and Power, Azusa Light & Water, and Redding Electric Utility, as well as Connecticut utility United Illuminating. But SCE’s contract represents a first in terms of a large-scale, investor-owned utility placing a dollar value on the range of grid capacity, stability and reliability benefits that distributed thermal storage can provide, James White, acting CFO of Ice Energy, said in a Wednesday interview. “The financial side of the contracts will be a bit different from some of those we’ve done before,” he said, “but the operational side is effectively the same. We don’t sell Ice Bear units to utilities -- we are the turnkey provider of megawatts. They say, 'We want 25 megawatts,' and we go out and provide turnkey site selection, installation,” and operations over the twenty-year lifespan of the systems, he said. Ice Energy is “actively working with partners to plan the site selection process” for the SCE procurement, looking for typical sites that could house five to ten 5-ton AC units per building. Projects will likely be staged over time, with the first projects helping to pay for future projects, he said. No matter where they’re located, Ice Energy will monitor and control the units in concert to help SCE reduce system peaks, manage transmission congestion, and lessen the burden on local distribution grid circuits that might otherwise have to be replaced, he said. SCE is targeting a stretch of Orange County and environs that is facing local and system-wide energy and grid stability issues due to the closure of the San Onofre Nuclear Generation Station, as well as facing future pressures from the planned closure of once-through cooled power plants in the region. All told, SCE announced contracts for 2.2 gigawatts of resources last week, including about 400 megawatts of gas-fired power plants, 44 megawatts of behind-the-meter solar, and more than 200 megawatts of energy efficiency and demand response. Ice Energy’s capabilities aren’t precisely the same as the battery-based projects SCE has contracted from Stem, AES, NRG and Advanced Microgrid Solutions. First of all, thermal energy storage doesn’t inject power back into the grid -- its sole purpose is to cut down on power that would otherwise be used up by air conditioning. But with AC loads making up 30 percent to 40 percent of SCE’s summer afternoon peaks, “We have the advantage of being a niche player in a huge niche,” he said. Thermal storage is also ideal for long blocks of time -- in the case of SCE’s contract, at least two hours of load shifting it’s looking for to meet the state’s solar PV-driven resource adequacy requirements. On the customer side, building owners get the direct benefit of reduced utility bills, both from shifting power use from expensive daytime to cheap nighttime rates, and from reducing consumption peaks that could impact demand charges, he said. White declined to disclose how Ice Energy prices its Ice Bear units or the megawatts of energy shifting they add up to in aggregate. Thermal energy storage has been around for decades, but it’s mostly been done at grand scale, with companies like Calmac installing systems for skyscrapers, campuses or municipal complexes. 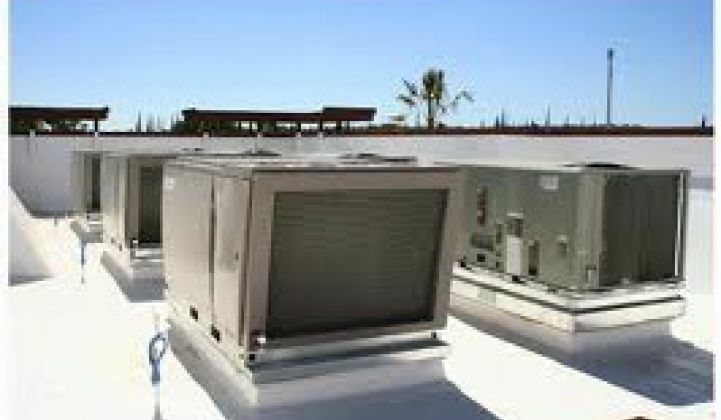 But rooftop AC units are becoming more networked and integrated into building energy management systems all the time, making them a likely target for more fine-grained control. Distributed thermal energy storage has also been around for decades in the form of water heaters or space heaters that can store up heat and discharge it later on to shift their electricity consumption patterns. We’ve been covering the latest efforts on revamping these systems for the smart grid, with specially designed water heaters that can respond to second-by-second grid commands.